Classic Call of Cthulhu is set in the real world but in a time that, with one or two nonagenarian exceptions, none of us remembers. The pace of change has rendered this period as real to us as Middle Earth. What inhabitants of the 1920s accepted as commonplace is now consigned to the history books, to be learned about as just a collection of facts and sepia photographs. So the Keeper has a challenge similar in vein to that of a Dungeon Master who has to create a living, breathing world that is at the same time our world but fantastical and alien. 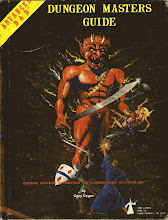 The Keeper does, however have one advantage over the struggling DM – the world of CoC does exist, or at least it used to and there are copious records to attest to that fact. Those records are like a treasure trove, packed with facts, recollections and images that have the potential to bring life to what for us is tantamount to an alien world. In my post on sources of information for Call of Cthulhu, I’ve listed a great many sites where these records can be found. Properly used, they are a Keeper’s best friend. Yet if the Keeper turns around and tells the players in 1920 that President Roosevelt is travelling into New York on Route 66, he’s laid himself open to challenges in at least three areas (four if he uses an anachronistic car). If, like most Keepers and players, you know little about the 1920s, there are two options you can adopt. One is to ignore the facts and wing it. Just play the adventure, no-one’s going to notice the errors and if they do, you can shrug and tell them to go and write their own history book. That’s an approach that, with a group of players who share the same outlook, can work. It would be a shame if that were the case, because well-placed details bring a game to life. The second option is to ladle on the details with a big spoon. Whilst this is all well and good to begin with, the Keeper needs to remember one salient caveat. Research is like salt. It adds flavour but too much makes you sick. If I were to ask you to give me an account of your day, you’d probably not tell me the make of your breakfast cereal, the toothpaste you used or the brand of coffee you drank. You’d probably use generic terminology for those things. The degree to which you’d use that vagueness of description would probably depend on how well you thought I knew your life and how much detail you felt I needed in order to make sense of your account. We probably both live in a western industrialised society and there are things that we take for granted that each of us know. I don’t have to listen to a description of how your car works, or – for that matter – what make it is or its performance details. You might tell me that it takes three hours for you to drive 200 miles but it took longer last winter because of the snow. You might enthusiastically tell me about your favourite TV programme but you wouldn’t give me an in-depth explanation of television itself. 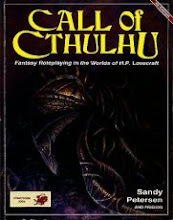 Both the world we live in today and the world of Call of Cthulhu share certain details and it’s those that circumscribe the amount of information we need when running our games. A fact should be considered, weighed and then slipped into the narrative subtly so that virtually no-one notices. And it should only be done once. The players are there to play, not to study 20th century history. When I put my author’s hat on and work on my fantasy novel, I have an acronym that I use - WANTON – Would Add Nothing TO Narrative. This keeps my work focused and free of unnecessary clutter – or so I hope. The same holds true of the description I write for the pbem. Remember that stretching a point to slot something interesting in is fine, but remember that over-stretching causes breakage. By way of example, I’m including here a long section of my recent pbem, The Majestic Mystery, which gives an idea of the sort of thing I was sending out to players. Everything included is as historically accurate as I could make it, yet I hope the detail didn’t overwhelm the story. You make your way to the dinner table where Dwight Albert has already taken his seat and has his wallet out. He passes the waiter a $50 bill and sends the man off with an imperious gesture. He rises as Julia arrives and draws her chair out for her. He shakes the hands of Alessandro and Solomon, less reserved now that he knows who they are with. You note that Alice is seated with the Frosts. Chester Allen and O'Mahony are on a nearby table. A fresh bottle of whiskey has somehow followed them there. Eyebrows are raised, nevertheless when Alessandro’s choice of guest for the last place arrives at the table. Daniel Quigley might be good-looking in a saturnine way if he ate regularly and got some sleep. He is twenty-six but no-one would know it. He shakes Solomon’s hand with a less than enthusiastic grip and takes Julia’s hand and kisses it briefly. His handshake for Dwight is rather perfunctory. Thanks to Dwight’s foresight in buying the waiter, you have more or less the best of everything. He has scrutinised the wine list and suggests a bottle or two of 1904 or 1911 Bordeaux, on finding that the hotel has no 1900, which he describes as an excellent year. For Alessandro, he acquires a White Burgundy 1906 which he believes you would find outstanding. As regards champagne, he declares that since there were very poor harvests between 1902 and 1909, the champagne riots of 1910 and 1911 and the intervention of the war, he would not recommend drinking it at present. Quigley is not particularly impressed by this show of largesse. Drawing a long pull on an unfiltered Gitane, he languidly states “I am a friend of the Green Fairy; she is a tender lover and leaves me intoxicated by her verdant beauty”. He summons the waiter and whispers something into his ear. A few minutes later, a green bottle of Dornier-Tuller Absinthe, a bowl of sugar and a carafe of ice water arrives at the table. He offers the bottle around; Dwight seems less than pleased but is probably too polite to say anything. Quigley’s love of French culture, he explains, came from a stay in Paris the previous year, during which time he met Gertrude Stein who he describes as “tiresomely ordinary in an extraordinary way” and made contact with the French surrealists, including Paul Eluard, Tristan Tzara and Andre Breton. Julia is aware from her time in France that whilst the former means 'disturbing', the latter means 'terrifying'. “They would have nothing more to do with me. I came home via London and sojourned there for a week or two; whilst I was there, I had the pleasure of meeting two very interesting gentlemen, Charles Bennett and George Jones, who describe themselves as mystics. And of course, I had the splendid good fortune to meet Arthur Rackham himself. I greatly admire his style – are you familiar with it? If anyone is familiar with Rackham’s style and work, Quigley will spend several minutes comparing favourites. Alessandro mentions the fact that Quigley has been working on pictures whilst staying here. The artist affects a moue of embarrassment. Regardless of what anyone else says, Dwight is stalwart in his refusal. Dwight will not sit still for this but nevertheless he remains controlled in his anger. He regales the table with his war service and the battles in which he was a participant in France. Dinner continues with Quigley and Dwight giving each other frosty glances across the table but remaining restrainedly polite. As dinner ends and the table staff clear away the plates and glasses, there is an announcement. Team Adventure - Yay! Hobgoblins! Having despatched the giant poisonous snake and found their loot, the party did something that I had not expected them to do – they decided to try the other doors. In retrospect, they didn’t know that behind each door was a ghoul but even so – “you’ve found the treasure, guys, don’t look any further”. Still, luckily for them, they managed to have only one ghoul to fight at a time (regular readers may remember a session of the Training Dungeon where Junior Grognard’s party was torn to shreds by a pack of hungry ghouls) and having disposed of the grisly inhabitants, decided to press on down the left-hand (as you’re looking at the map) passage. They crossed a bridge that spanned another tunnel, visible through iron-barred windows, which none of the party could shift, which was a handy introduction to Bend Bars rolls. We had touched on this during the attempt by Alurax to free his companions from the skeleton prison (room 11 on the first map) but now everyone got to roll up their STR to check their BB%. decided to go trotting off on his own. He chose the left-hand turn and soon came to a tunnel at the end of which were two suspicious objects on poles. Getting a little closer, he saw that they were dwarven heads, complete with beards and helmets. As he neared them, I had him roll up his DEX and then make a save against it. He failed and alerted the placers of the heads to his presence - cue attack of the hobgoblin sentries. We had a couple of heavy combat sessions when Team Adventure managed to beat off attacks from two waves of hobbos but by this time, they'd expended all their Heals and Spells and thought it best to make a retreat back to town. There are some major differences between megadungeons for adults and ones for kids. For a start, the kids won't tolerate empty rooms. A series of empty rooms is a sure-fire way of causing major boredom. I like to keep the monsters coming, even if the layout of the dungeon makes no logical sense (monsters with no way of getting food, water etc). Also, the lethality of it needs to be scaled back and there's little point at this stage in putting something like a complex plot into the dungeon (i.e. dungeon politics, clashes between groups etc). Treasure may be a little on the high side but these are boys we're talking about and youngsters at that. So they level up quickly? Meh...means we get to the G modules that little bit quicker! And of course they can always retire those characters and roll up some new ones, based on what they learn in little bite-size chunks as they're doing this one. During the Easter holidays, we had daytime availability for virtually all the boys in the group and we managed to get two sessions in one week. On the next visit to Junior Megadungeon, the gang decided, after a bit of pondering to probe the hobgoblin area again. During their absence from the dungeon, I'd ruled that the hobgoblins had been sufficiently freaked out by the carnage caused by the party's attacks that they had offered quite a large share of their treasure to some nearby ogres for protection. That meant that the party encountered most of the remaining hobgoblins and an ogre just when they didn't expect it. The ogre got some pretty rubbish hit rolls but nevertheless caused the party some serious inconvenience, before succumbing to a final magic missile from Elysia (Mummy Grognard’s MU). The rest of the party fell one by one to the hobgoblins and finally Junior Grognard’s fighter was the only one left standing on 1hp against a sole surviving hobgoblin (3 others had legged it after seeing the ogre go down). This last hobgoblin took one look at the carnage that had happened to his so-called protection and surrendered to JG, who wisely didn't kill him. I had him roll under his INT on a d20 to work out that he could drag the party back to one of the ghoul rooms, where their recovery slowly occurred. The captured hobgoblin led Elysia to the treasure that had not been taken by the ogres (about 1200gp worth) and they eventually got back to town where Merlin the thief (K’s character) was revealed to have levelled up. Join us next time to see the d30 rule make a very impressive first appearance. Other People – they’re everywhere. When you pass somebody in the street and barely look at them, they’re Adventure Dressing but when you stop and interact with them, they become NPCs. And of course, without wishing to sound like a certain Justice Secretary, there are different types of NPC, depending on the function that they are intended to perform within an adventure. Some get perhaps one line of description, others have the privilege of an entire stat block plus back story. That, of course, is the state of affairs in a conventional published Call of Cthulhu adventure. With the less sandbox-oriented game, NPCs need information because they do indeed perform a specific function – either antagonists for the party in which case their conflict potential needs to be quantified so that they can give our hapless heroes a run for their money or as sources of information, in which case both the information that they will be called upon to impart and the conditions under which they will do so have to be detailed so that the party have hoops through which to jump. Entia non sunt multiplicanda praeter necessitatem, otherwise known as Occam’s Razor is a principle which should hold true in gaming as well as life. I’m taking it to indicate that NPCs should only be detailed as far as is necessary to give flavour to the game and no further. Firstly, to do otherwise is making work for a Keeper when it’s not necessary. There’s enough record keeping and information to manage without making any extra. We’ve already discussed only staying two steps ahead of the players and this should hold true for NPCs as well. There really is no need (unless you’re a glutton for punishment) to start working out precise skill distribution for the antique shop owner in Amsterdam if the chances of the party actually meeting him, let alone him using any of the skills you’re writing down are going to be next to nil for the following six months. The point at which an NPC’s skill levels are worked out should be the point at which the party actually meet him or her and they actually use that skill. It may be that some skill slots are never filled, because they’re never called for. That’s fine – the curator of the museum’s Drive Auto skill is irrelevant if he goes everywhere by subway. Secondly, there is always the danger, unless the Keeper is particularly dispassionate, that if an NPC begins to acquire detail, they may also begin to gain a personality and start to be thought of by the Keeper as more important than they actually are. We’ve all been there – a set of numbers on a page takes on a life and before you know it, you actually care about the NPC. After all, investing in a sheet of paper and some numbers is what the game is all about, so why should it be so odd if the Keeper starts to do it as well? He’s probably been a player too. It happens. Unfortunately, when it does happen, it’s only natural, either consciously or subconsciously, to take steps to preserve the NPC and that runs the very real danger of violating the development of the game. However, it may be that in the course of the developing adventure, an NPC attaches themselves to the party and starts to play a particular role. If this is the case, the only skills that need setting up are those which relate to the role that they are playing. Again, keep it simple and worry about that which is absolutely necessary. A rough rule of thumb would probably be that skills in their area of expertise would weigh in at 50 – 60% and other skills anywhere from 20 – 30%. That having been said, to avoid the party being outgunned if they take on someone like that, I tend to set weapons skills generally at about 40-50% or so. I’m now going to discuss an aspect of the pbem which only really applies if, like my group, you use rotating Keepers. When the mantle of Keeper passes to the next person in the group, what happens to the PC that they were playing (assuming that said PC survived reasonably intact)? I’ve worked it that the PC becomes an NPC run by the Keeper but still very much in the style that they operated previously. Of course, this NPC does, in theory, possess access to the knowledge of the Keeper as regards the forthcoming events and secrets that the party don’t have. This is why the now GMPC should be used as a nudger and hinter but always very sparingly. I used my GMPC in the Majestic adventure sometimes to advance an erroneous opinion or point of view to serve as a stimulus for the party to work their way to the correct solution. It takes a certain mental discipline not to turn the GMPC into a Mary Sue, solving problems and overcoming challenges without fail, but such a character played as a fallible, normal, realistic person can add to the feeling of an adventure. If the Keeper doesn’t feel as if they can carry this off, it’s better to have their character go on a sabbatical for the duration of the adventure. They can always return with some tantalising hints about the next adventure – provided the party hasn’t been wiped out in the meantime. And even if they have, there is now one survivor, determined to find out what happened and, if necessary, avenge them. Voila! The perfect hook for the next game! Next time, I’ll be discussing research – how much is too much and when to stop before an adventure becomes a history lesson. The party are travelling through either an area of the dungeon or an area of wilderness when they are suddenly surrounded by blink dogs. The actions of the dogs indicate that no harm is intended and the dogs make every effort to persuade the party to come with them to see their leader, the Lord of the Blink Dogs, who is concerned at a new development in the area. The Lord of the Blink Dogs uses a human interpreter to speak for him, although the basic telepathic ability of these creatures may enable them to project emotions and sensations towards even those who are not psionically sensitive. It seems that recent intense blink and displacement action between the Blink Dogs and their arch-enemies, the Displacer Beasts has caused fractures in space-time, leading to strange effects at various points. The party may have already encountered such phenomena without being aware of their nature or cause. He wants the Displacer Beasts destroyed or defeated but warns that use of magic may well cause temporal ruptures so spells are to be kept firmly in their books. Magic items may well cause similar effects. It may also be that a precious mineral can be found in the area which can be used to make a device for sealing space-time fractures. The mineral has a particular resonance which Displacer Beasts find arousing and like to be around. The mineral can be forged into a device by a skilled smith or alchemist. It needs several other precious components, e.g. diamonds, platinum, all of which will be consumed when the device is triggered. The blink dogs can accompany them but cannot use their blink powers in case they cause space-time to rip completely in the area and plunge the party into a randomly determined universe or time zone. The Displacer Beasts, being only semi-intelligent may not have noticed this new effect or may not care particularly. Displacement activity by itself will only cause the effects to continue, not deteriorate. 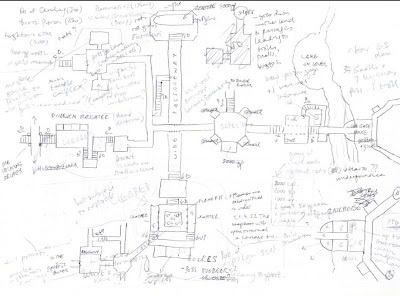 To begin with, the dungeon, as I’ve previously mentioned was a mere sixteen rooms large. 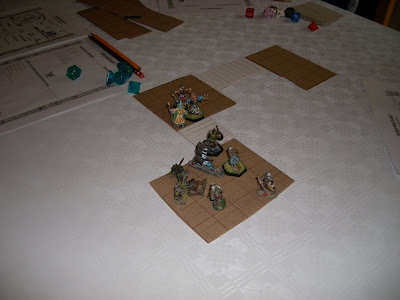 I had skeletons, giant spiders, goblins, kobolds and – in the last room – zombies. A nice mix that would give the fighters and the clerics something to do. There were also pressure pads and locked doors that the thief might be able to assist with. I also set up the levels so that there were three ways down – the shaft, using rope for climbing, the stairs – the more conventional way, and the underground river, which would require a roll to check that they had not lost consciousness on the way down. I put a crotchety old man on an island in the middle of the underground lake to serve as a bit of a sanctuary, albeit a temporary one and perhaps give a bit of advice if the kids were confused or lost. I also had a statue in room 10 that held a mace that would do double damage against skeletons and a set of statues in room 5 that would animate if pressure pads were triggered, capturing PCs and taking them to the cells in Room 11, a destination to which the skeletons would take anybody rendered unconscious by their attacks. Eventually, I was sure that the party would reach the final room, 16, where a set of six coffins awaited, each containing a zombie. In the centre of the ring of coffins was a hole that matched the skull pommel at the end of the mace from room 10. This would open a trapdoor which led to a room containing 3000gp, about 500 for each member of the party. Of course, predicting what a party is going to do has caught out better DMs than I, and so I had to face the possibility that they would reach this room sooner rather than later, gain the treasure and then ask for more without having experienced enough of dungeon-delving to be prepared for it. With this in mind, I changed the treasure room into an octagonal chamber with the stairs from the zombie room entering it on the ‘north’ side. A passage ran from it eastwards and another westwards. On the south wall was a dial with five settings, and I made notes to which setting triggered which effect – behind four of the doors were ghouls, the fifth gave entrance to a treasure chamber but this was guarded by a poisonous snake. Settings 1 to 3 opened doors 1 to 3, discharging one ghoul at a time, Setting 4 opened all the ghoul doors at once and Setting 5 opened the treasure door. They managed to pick Setting 5 first and, having killed the snake – Junior Grognard did it 10 points of damage with one hack (although it bit the magic user, who went to 0 at once) - got their hands on the gold. They were mightily pleased with this – their first big score, after some piddling yields from looting dead goblins and the like. This was more or less the end of that particular session – we’d taken two sessions to get down to this point. At the start of the next session, I announced the new rule on damage, because it occurred to me that unless there was some prospect of death at some point, the characters would just keep on coming back healed and never fear anything worse than 0hp and unconsciousness. I therefore ruled that damage sufficient to take a character to –10 or more would mean that they were dead and would have to be raised, which I priced at 5000gp. This had the effect of reminding them that they could be killed but it was unlikely and reducing the amount of gold that would eventually start sloshing around the adventure. However, as we shall see in future sessions, this was not quite how it worked out in practice. 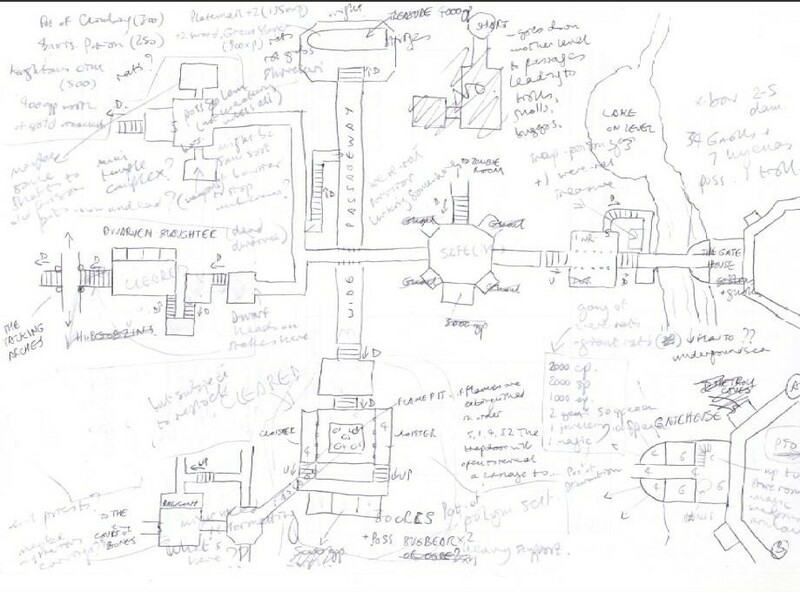 Having sketched out ideas, chambers and corridors for as far as I could envisage the party getting, it was time to open up the dungeon and let them start exploring. One of the main components of a pbem is of course the e-mail system itself. One thing a Keeper is going to have to be prepared for is the fact that the e-mail folder is going to get very big, very quickly. My adventure, which ran from July 2010 to February 2011 had, at the last count, over two thousand e-mails. Even assuming that some of those were duplicates – and I’m pretty assiduous at deleting earlier versions of threads – the total is still pretty big. Simple e-mails from the Keeper rapidly become threads which can run and run. Strategic deletion of earlier versions of threads is a necessity but beware getting too over-enthusiastic with the delete button – with multiple players may come replies to earlier e-mails that contain important information not held elsewhere and these replies may be mistaken for part of the thread. If your e-mail system allows you to file e-mails into individual folders, it may be a very good idea to allocate each player a folder into which their communications can be put. Of course, even Windows Mail can sort by sender, meaning that finding a particular e-mail is never a wholly impossible task (unless you’ve double-deleted it). As we’ve previously covered, the e-mail means that individual players can have bulletins updated to their own character’s adventure requirements – if three people are in a room and each is talking to a different person, this is easily handled. Good categories into which to sort the pictures, and – from personal experience – I found to be necessary are portraits, building interiors, building exteriors, landscapes, transport interiors and transport exteriors, social images (arts, leisure, fashion, entertainment) and miscellaneous ones like foodstuffs, clothing, drinks, etc. You may find that as the weeks go on, you find an image sparks an idea for a future adventure development. A bit of a short one this week. Next time, I’ll be discussing how to handle NPCs so that they don’t become too much trouble to handle and what to do with the GMPC to avoid them becoming a Mary Sue. I was having a chat with Mummy Grognard the other day, principally about the new Team Adventure sessions. We've already agreed that following Gygaxian guidelines on females and young in lairs is out - no families to be slaughtered. To be honest, I've never played the females and young option, even back in the day. She also had misgivings about the boys facing human opponents, since they are playing human characters at present (the demi-human options are going to be filtered in as we progress and - inevitably - have to roll up new characters). Her justification for avoiding human on human action is that we're getting enough of this in the real world and for her (and for the boys as well, I suppose) D&D is an escape from the nastiness of the real world - yes, it contains killing but it's in a fantasy milieu, a conceptual step removed from reality and can be contextualised as such. The logical end of this line of thinking, of course, we thought, would be a game in which the boys played demi-humans to the exclusion of other options - in short, a game with no humans. Now, that set me thinking - I know that there are campaigns out there where there are no demi-humans or the demi-humans have been redefined so as to be unrecognisable from those contained in the PHB but are there (or have there been) any campaigns where the world contains no humans at all? The black pudding is a monster composed of groups of single cells. It is a scavenger/hunter found only in underground areas normally. The body structure of a black pudding is such that it can pass (flow) through narrow openings (such as a 1" crack under a door). The monster travels equally well on walls or ceilings as well as floors. Its tiny mouths and saliva do 3-24 hit points of damage per melee round to exposed flesh. If the monster needs to dissolve wood in order to obtain food, it can eat away about a two inch thickness of wood equal in area to its diameter in 1 melee round. Black puddings also eat away metal with their corrosive saliva: Chain mail in 1 melee round, plate mail in 2, and an additional melee round for magical armour at a rate of 1 melee round for each plus of armour. Thus, +1 magic (plate) armour would have to be in contact with a black pudding for 3 melee rounds before it dissolved. If chopped or struck, the monster is broken into two or more parts, each able to attack. The same is true if it is attacked by lightning. Cold does not affect it. Fire causes normal damage to this monster, and they avoid flames. Black puddings sometimes have colour variation, grey, brown, and white being not uncommon. Black puddings with 10-20 hit points are about 5' diameter, those of 21 -40 hit points 6', 41-60 are 7', and 61-80 are 8'. Note that even those of the smallest size (or those as small as 1' diameter) are able to deliver normal damage. This is due to the fact that larger puddings simply do not use all of their mouth openings as they are not exposed. 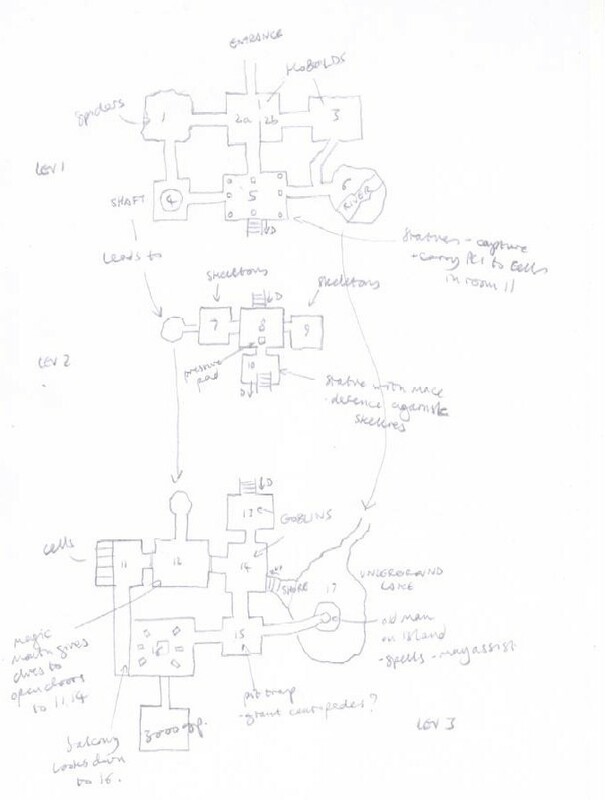 This adventure takes place as the party enter a large, long chamber whose floor is made of obsidian slabs. This glassy substance is fairly slippery and each member of the party who tries to walk across it needs to save vs. DEX each 20’ or lose their footing. This will become very relevant soon. At the far end of the room is an altar. Access to this is blocked by a wall of force about ten feet or so into the chamber. There is no way of physically breaking through this. On the altar is a complex sculpture, whose arms can be moved into a number of different permutations. At the near end of the room is a large stone dial set into the wall. This has an inner and an outer wheel to it. The wheels can be aligned to five settings. Whichever setting is selected first, there is an initial delay of fifteen seconds during which time the wall of force dissipates. The party might think that they have achieved this through pure chance alone and may believe that the way to the altar has been cleared. 1) Certain (number to be determined by the DM) of the obsidian slabs will slide aside and the black puddings in the pits beneath them will rise up to become level with the rest of the floor. It may not be apparent to the party that anything has actually happened, since the puddings and the floor are the same colour. Not apparent until they tread on one, that is. 5) All the slabs open at the same time, and the floors of the pits rise up, pushing the black puddings out onto the floor. The door to the chamber will close behind the party. The only way to open it is to pull the right permutation of arms on the altar at the far end of the room. If the party manage to defeat the puddings, they will find that at the bottom of each pit there is 1d20gp worth of loose coinage and gems from previous victims of the trap. The altar at the far end of the chamber will hold obsidian jewellery which will be to a value of at least 10,000gp. DG note - the idea of a black pudding and obsidian combo comes from a very old Dragon article (can't remember which) but I've whipped it up and given it a bit of a spin for your delectation and delight. Well, grumble no longer. Because for the past few weeks, I’ve been gaming every weekend and during the Easter holidays twice a week with a group of four or five youngsters, aged 8 to 10 who are exploring a megadungeon that is growing as they go deeper, sandbox stylie. Wowser, I hear you cry. That’s impressive. How did you achieve this? Well, it started small. Junior Grognard had a friend, henceforth referred to as F over to play and during the visit, we mentioned D&D and what it involved. We’d been playing the D&D Top Trumps and he was getting used to the concept of monsters (this is recommended as an intro for kids and D&D – it seems to work very well so far). 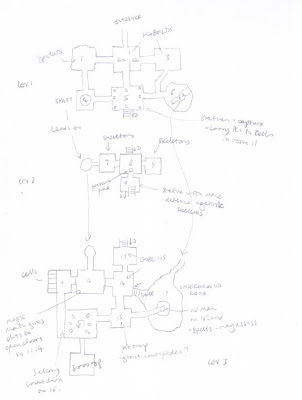 F sounded interested and so I drew up a simple three-level sixteen room dungeon that was light on fatality (after a chat with Mummy Grognard who outlined her worries that F might not be able to cope with full-on dungeon mayhem including death). She agreed to play a MU in order to keep the boys on track and ensure that they behaved themselves. So, I had two boys who wanted to get into action straight away and I did not want to delay this through having to explain the rolling up procedure, choosing a character class, rolling the money and buying the equipment etc, so I decided to go down the route of pre-gens and did five sheets, one for each character (each player would run two characters except Mummy Grognard who would be running the MU and doing the admin) - two fighters, a thief, a cleric and a magic-user. with the armour and weapon pre-selected. All very basic, easy to understand and follow. I decided to give the cleric four Heal slots per dungeon day and the MU would get four Spell cards to be expended on a selection of 10 spells from the 1st level spell list in the PHB. I made small cardboard tokens for these, which were given to the relevant players and they would hand them to me when they used one of the Heals or Spells. No cards meant no more magic. This was a tactic that I have since expanded to cover arrows and oil bombs. Now, I was fully prepared for the two lads and their adult mentor to game on until they got bored. But then, just after lunch, another friend (who we’ll call K) from across the road turned up purely by chance to see if Junior Grognard wanted to play. We dragged him in and asked him if he wanted to join the game. Seeing the dice, the figures and the floorplans out on the table, I guess that curiosity got the better of him and he was in. We had a high old time with kobolds, goblins and an underground river down which the MU dived, using it as a helter skelter and we called it a day at that point. K went home and to be honest, I was not sure if we’d see him again. How wrong I was. Mummy Grognard, who does volunteer work at the local school was busy working away on my behalf, taking every opportunity to mention D&D to the kids there. We got another boy, T, the next week who joined in and although he was a quiet soul and rather reserved (although anyone would be quiet compared to Junior Grognard) he came back again for another session, as did K. Although family commitments meant that F was not present for all gaming sessions, his dad seemed to buy into the gaming experience quite quickly, getting his son a new set of dice and printing off OSRIC in its entirety (that’s what I call dedication). We got another friend, M, to join the group which now numbers five (or six if F is available). As it was T’s birthday a week or so ago, we bought him his own set of dice and a bag in which to keep them, which he has brought to each session since. It’s a ritual that we intend to continue as the birthdays keep coming. We also had K stand up and receive a round of applause when he was the first to level up. Of course we now have a problem in that Mummy Grognard’s efforts on publicising the game have borne fruit to such an extent that we have more interested children than seats at the table. I’d dearly like to give them all the opportunity to dungeon-delve but DM capacity is limited. Perhaps an emergency training programme for DMs could be instituted. I don’t know. I don’t want to waste the enthusiasm that’s been generated but I can’t see a way past this. After discussion with Mummy Grognard, I also found and downloaded the Labyrinth Lord character sheets as they are clearly formatted and legible enough for the boys to use without getting things cluttered and having to write very small. They’ve been using them for a few weeks now and I was delighted to find that they were all filling in their character sketches during a break in the action for some banana milkshake. Next time I’ll be recounting how we moved from a simple sixteen-room dungeon to something that has grown and grown until it has taken on the dimensions and complexity of a megadungeon, along with the expansion of the rules we’re using to bring things closer to the way that I used to play 1e.